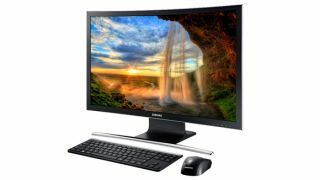 Samsung has ensured that its CES 2015 hype train left the station early with a slew of announcements this week, the latest of which is the Windows 8.1-powered Ativ One 7 Curved all-in-one curved PC. The company says it's the first curved all-in-one PC, with a 27-inch "full HD display, smart connectivity and advanced sound features." The announcement also highlights the display's color capabilities and wide 178-degree viewing angles, its "metallic deco frame" ("with complimentary stand"), and the PC's cross-device content sharing and Samsung phone connectivity features through SideSync 3.0 and Samsung Link 2.0. As far as specs, the Ativ One 7 Curved packs Intel's Core i5 chip, 8GB of RAM, a 1TB flash drive, and Bluetooth Music Play 3.0, which lets users connect Bluetooth devices to the PC's dual 10W speakers even when it's turned off. The Samsung Ativ One 7 Curved PC will launch in the first quarter of 2015 at $1,300 (about £830, AU$1,600). Watch out for more coverage at CES next week. Samsung this week also introduced a set of alien-looking speakers and curved soundbars, a more powerful Galaxy Note 4, a virtual reality streaming service, and a fanless MacBook Air competitor.